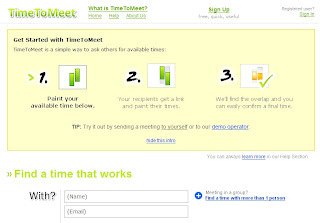 TimeToMeet is a nice service that helps you make free time to meet or call other people. You can use its tool to mark your available time on chart, set your time zone ( international time zone available ), after that, you can send a link to your friends. It is very simple. TimeToMeet has different choice, without register user or basic register user are free. If you need more features you can pick pro payment user.